Home » ForeignPostcards » Caribbean B.W.I. This is a nice old Real Photo postcard image! It pictures a sharp view of a typical native thatched roof hut. A family poses out front with weaved basket. 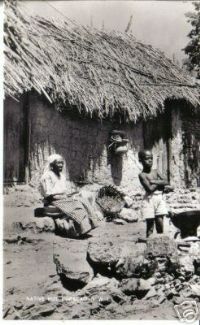 Front of card reads "Native Hut , Curacao , N.W.I. ". A nice old Caribbean postcard image! Back of postcard is divided and is postally unused. Back also is printed "Julius N Penha & Sons , Inc. Curacao N.W.I.". Condition-Good to excellent.